Starting September 23, runners from around the world will experience a challenge unlike any other. 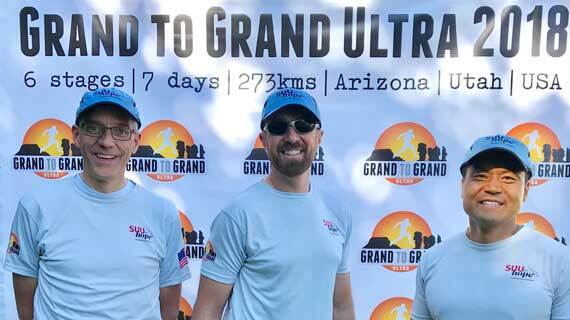 The Grand to Grand Ultra race starts at the North Rim of the Grand Canyon, includes seven days of running and camping, then finishes at the summit of the Grand Staircase. True to his heart, Southern Utah University President Scott L Wyatt will be joining the racers to raise money for the future on-campus child care facility. With six stages in seven days, approximately 135 runners from 22 countries will travel 170 miles and gain 18,000 feet of elevation through high desert, slot canyons, national forests and some of the most remote country in the United States. Stages vary in distance from 8 miles to 53 miles and overnight camps are built along the way. The Grand to Grand Ultra race is the adventure of a lifetime and the first self-supported stage footrace ever to take place in the U.S., meaning that each racer is responsible to carry all equipment, clothing and food necessary for the seven days. The three-man SUU team consists of President Wyatt along with William Heyborne, associate professor of biology and Johnny Oh, director of global engagement. The group has dedicated this race as a fundraiser for the future Sorenson Legacy Foundation Child and Family Development Center. The center is a commitment to the retention and graduation of SUU students by providing a high quality facility offering on-campus childcare and parent and family support. Through various fundraisers SUU has raised about $1.3 million for the center. The race lasts from September 23 until 29. Track the progress of President Wyatt and all the racers throughout the week on the Grand to Grand Ultra website.